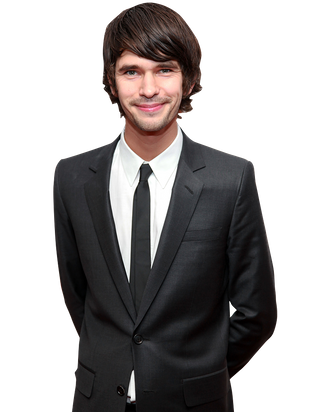 Ben Whishaw is at his best playing troubled romantics: Keats, Dylan, and his latest, Freddie Lyon on the new BBC series The Hour. Freddie might not have the same artistic pedigree as the others — he’s a reporter for a 1956 English news program — but he shares a poet’s passion in his relentless pursuit of the truth. He also pines for his best friend/boss Bel (played by Romola Garai), who in turn lusts for their lead presenter Hector (Dominic West). We spoke with Whishaw about The Hour ; his next film, Cloud Atlas, which he starts shooting in mid-September with Tom Tykwer and the Wachowskis; and his “Marilyn Manson” breasts. Your character is no stranger to crossword puzzles. You any good at those yourself? No! [Laughs.] I try to do the one in the Guardian, but I never get to the point where I can finish it, which is quite irritating. It’s disheartening. I suppose the characters are clever enough to do the things we cannot. You were shooting scenes about the 1956 Suez Canal crisis when things started heating up again in Egypt. What was that like? It was exciting, in a weird way. I even say in that episode that history repeats itself. And while the situation then was very different than what’s happening right now, it is the same kind of thing rearing its head. Of course, the situation in the media is different, and that’s one of the things the show explores. In 1956, the British government’s relationship with television was much more suspicious, and there was this thing called the “fortnight gag,” where the press was prohibited from discussing any issues being debated in the House of Commons until two weeks had passed, which meant you couldn’t really discuss the news. You couldn’t discuss what had just happened. That’s not so much the case now; the media is in a slightly freer situation. I couldn’t help thinking Freddie was like his day’s Julian Assange, in terms of being a maverick and an outsider, and enjoying being a bit threatening to the people in power. Even today, England is a very repressed repressive country, and there’s pressure to be kind of a certain way, so people do things that ultimately make them sad. I’m not sure that much has changed; not as much as one might like or hope. Let’s talk Cloud Atlas for a moment. Are you learning piano now for the movie? Yes, I am! It’s something I’ve wanted to do for ages, and it was a lovely excuse to fulfill that dream. I’m really enjoying it. I’m not that bad, but all I can play so far are the pieces in the film. And I’m reading the book now; I guess I’m about halfway through. One of your co-stars, Hugo Weaving, said he was playing six parts. Who are your characters? Everyone in the cast [which also includes Tom Hanks, Susan Sarandon, Halle Berry, and Jim Broadbent] is playing at least three parts, some big and some small. I’m doing three: Frobisher in the thirties; a female American in the seventies, in the Luisa Rey section; and a smallish role, where I’m basically an extra, in a modern-day nursing home, in the Timothy Cavendish section. Everybody’s swapping race and gender, so it’s very ambitious and quite fun. I’ll really love playing a woman! You’ve kind of played a woman before: You were a witch in the National Theatre’s adaptation of His Dark Materials, and in The Tempest, your Ariel had breasts. I did have breasts! [Laughs.] My Marilyn Manson breasts. I like playing highly androgynous characters like that. When I went to have my female body put on, I tried to confront how I would inhabit that body psychologically, emotionally. It was really interesting to try and think about what it would be to be a woman. I wished I lived in a time where actors did those kinds of transformative roles more. There was a time when acting had more to do with putting on wigs and noses and costumes, and part of me hungers for that time again. Back when they first did Shakespeare, all the female parts were played by men, and I’d love to have a go at something like that. I don’t think playing a woman would work as well for me on television, but it could work really beautifully onstage. Now people have more of a taste of nuance, of naturalistic acting, which is way more transparent, and supposedly reveals who the actor is. What else do you need to do to prep for Cloud Atlas? It’s shooting in Germany. Speak any German?